Bird Central - Window Feeder - Window Bird Feeders - window bird feeders, bay window feeders, in-house window bird feeders, cedar and maple construction - fun for the whole family, especially kids! The peek hole of the Window Feeder is designed to bring wild birds to your window for close viewing. Made of redwood, the bowls are hand turned on the lathe. 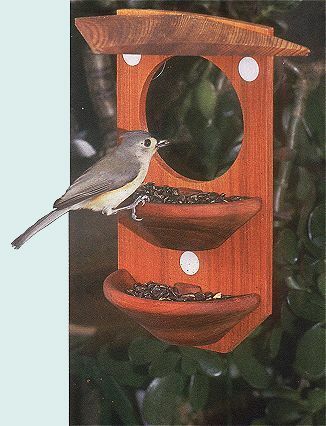 Three suction cups hold the feeder to the window Hand Crafted Redwood Lumber And Glass All-Purpose Feeder.